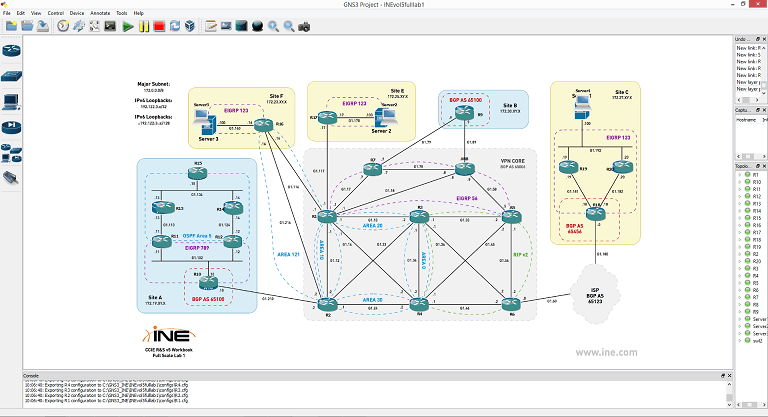 This post was updated on 21th of July 2015 with GNS3 version 1.3.7 INE Full-Scale Practice Lab1 download. Just scroll to the bottom for download link.. Yesterday INE finally added a Full-Scale LAB in their new CCIE Route and Switching blueprint 5 workbook. I realized this morning that you maybe don’t want to spend half of your day (like me) configuring this topology in GNS3. Better to just take it from here and start your lab right away. In my study process for the last year I made almost all my labs from INE on GNS3. In that way I was able to run the labs for more days in a row and not think about the money I would spent on rack rentals. Of course, you will still need some rack rentals particularly for troubleshooting sessions. For troubleshooting you need preconfigured rack because if you configure those topologies by yourself there is a big chance that you will see ticket answers and that will break the point of troubleshooting study process. All my config sessions were done on GNS3 and this one in the next few days will be also done in GNS3. If you want to spare some time and get the topology ready, up and running in few minutes you can download it at the end of this article. Read more and download files! Now that my topology in GNS3 is exactly as in INE Workbook 1 I can share it with you if you don’t want to do all the basic configurations and connections by yourself. After spending too much money on different rack rentals in the past few months I decided that I will definitely need to try to use GNS3 for simulating my CCIE labs. It will be the only solution if I didn’t want to spend all my money and then have no more left to pay myself trip to Cisco HQ. After one whole day of struggling with different GNS3 issues I did succeed to configure almost everything. From now I am able to use GNS3 for almost all chapters of my loved INE Workbook VOL.1 and probably VOL.2 also. There are some things that are not available on GNS3 simulated IOS and I will try to list them below at some point. Other thing that took me some time are that the interfaces are named differently. Cisco Etherswitch Module is added to router in GNS3 order to simulate some basic switch features that is normally not available in GNS3. There is no way to use 0/0 – 0/21 port names on that Etherswitch Module. The interfaces are 1/0 – 1/15 so you cannot do nobrainer paste of config to those “switch” devices. Some serial interfaces are for example Serial 0/0 and in the workbook they are Serial 0/0/0 so this is another one. There are furthermore some other changes to witch interfaces are different devices connected but all the devices now are connected to all other devices exactly as in VOL.1 physical topology. This file down there is prepared for BGP lab chapter of INE Workbook 1. but keep in mind that it can be good for all other parts of the Workbook as the interface configuration is not changed across the Workbook 1 so you just need to modify routing to get started with other chapters. Do the topology by yourself, you will learn more!